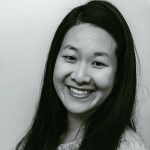 Published Jan 11, 2018 By Julia 55 CommentsThis post may contain affiliate links. 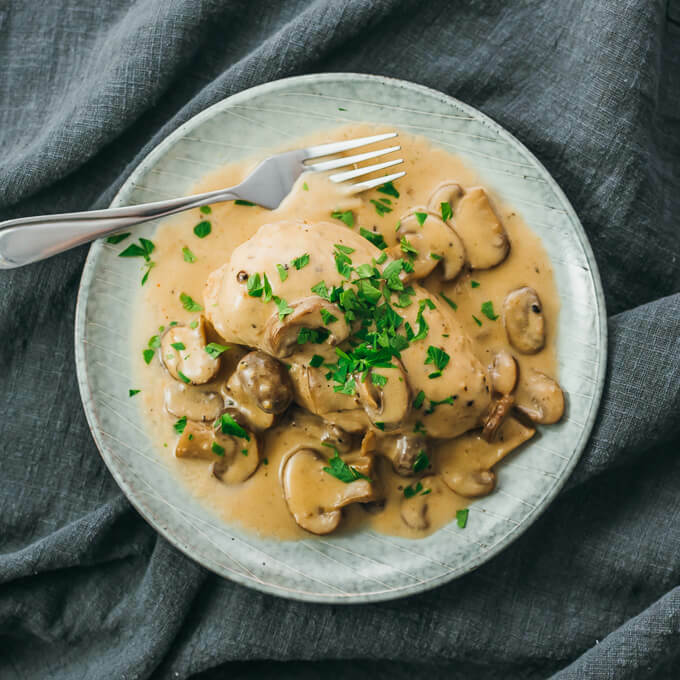 A quick weeknight chicken dinner with creamy mushroom gravy, made in the Instant Pot pressure cooker. 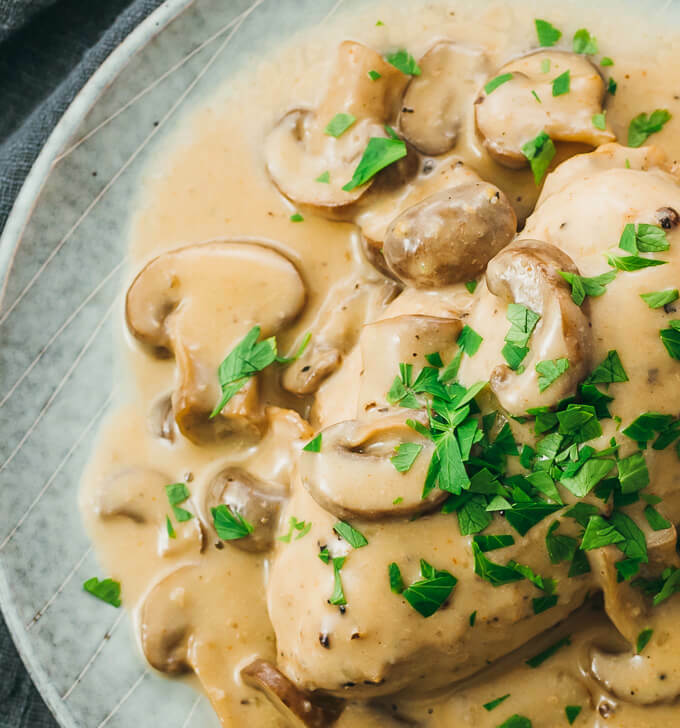 Imagine a cream of mushroom soup crossing paths with tender cooked chicken breasts, and you’ll get a good idea of what this dish is like. 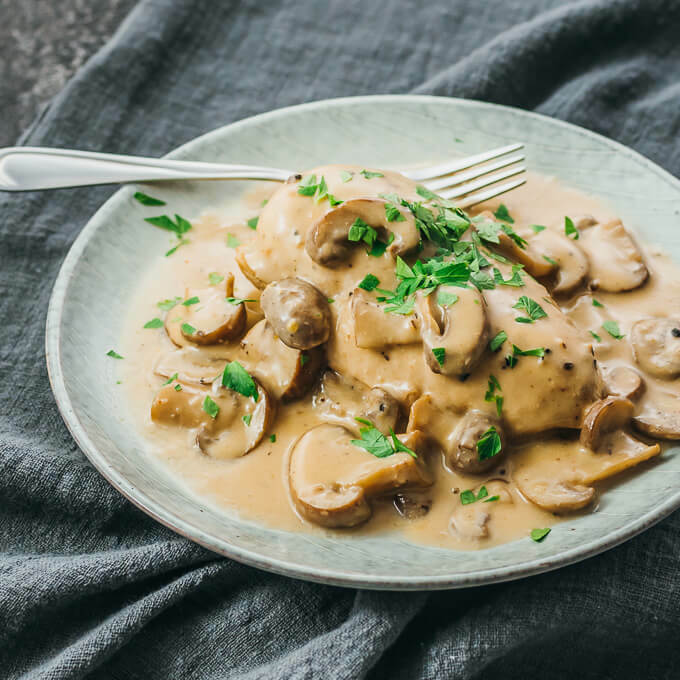 The chicken is pressure cooked in an Instant Pot until tender and juicy, while smothered with sauteed mushrooms and a smooth brown sauce. Both thick and creamy, the sauce is a rich gravy made using heavy cream and finely grated parmesan cheese, thickened with a bit of corn starch. It’s flavored with some garlic and just a pinch of cayenne powder for added kick. I’ve been hearing from a lot of readers who’ve received their first Instant Pot as a gift for their birthday or for Christmas. Many of them have made my Instant Pot chicken tikka masala and are looking for more chicken dinners that are also low in carbs and keto friendly. This mushroom chicken dish is similarly healthy and flavorful. 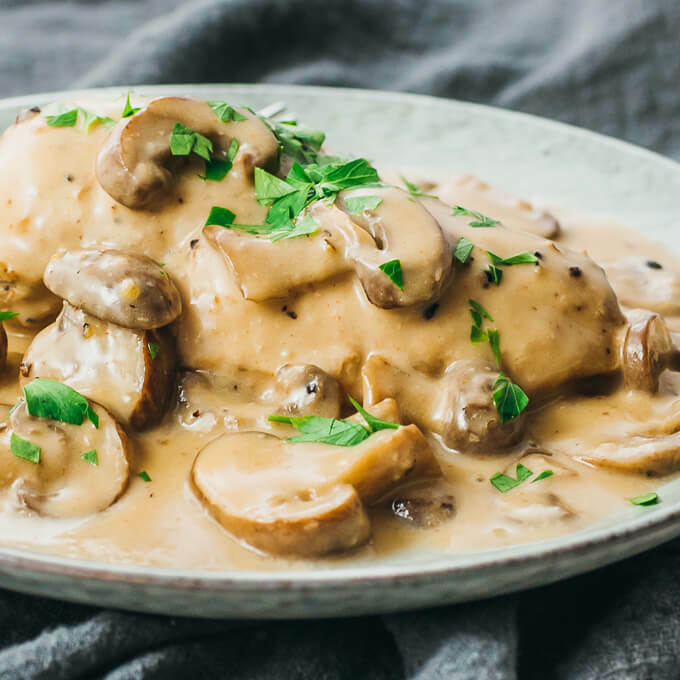 I initially experimented with making pork chops with mushroom gravy but ended up making this with chicken instead, as I much prefer the taste of chicken with this particular sauce. Moreover, I haven’t found a way to cook pork chops in the Instant Pot so they don’t easily overcook and become tough. I use two chicken breasts in this recipe, each weighing about 6-8 ounces. If your chicken breasts are larger, you may want to increase the pressure cooking time by 1-2 minutes. Note that the recipe doesn’t call for pan searing the chicken before pressure cooking — just drop the chicken in and start the pressure cooker. Easy and simple. This recipe yields 2 hearty servings, so it’s ideal for dinner for two. You won’t have to deal with any leftovers. 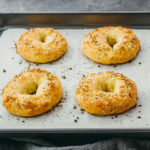 If you’re wondering what to serve this with, I suggest appetizers such as bacon wrapped jalapenos or low carb biscuits. A creamy chicken dinner with mushroom gravy made in the Instant Pot pressure cooker. Pat the chicken breasts dry with paper towels. Generously season all sides with salt and pepper. Set aside. Select the sauté mode on the pressure cooker for medium heat. When it has reached temperature, add olive oil to coat the bottom. Add mushrooms, cooking until they release their juices, a few minutes, stirring occasionally. Add cream, water, garlic, and cayenne. Stir together until well-mixed. Turn off the sauté mode. Add chicken breasts to the pot in a single layer, nudging aside the mushrooms. The chicken should be sitting at the bottom of the pot, submerged in the liquid. Cover and lock the lid, and seal the vent. Select the manual mode to cook for 6 minutes at high pressure. Let it naturally release pressure for 5 minutes, followed by a gradual manual release. Uncover and transfer the chicken breasts onto serving plates. Stir the liquid left in the pot, and scoop about 1/4 cup into a small bowl. Combine with corn starch and stir until completely dissolved. Add corn starch mixture to the pot. Gradually stir in parmesan cheese. Let simmer on the sauté mode until thickened to form a gravy, about 5 minutes, stirring frequently. Turn off the sauté mode. Add salt and pepper to taste. Spoon gravy on top of the chicken. Garnish with fresh parsley. 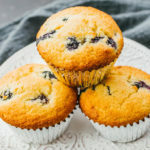 This recipe yields 10 g net carbs per serving. Can I use boneless chicken thighs instead? I’m happy to hear that it turned out well for you. Thanks for sharing your feedback, Judy! Can you use frozen chicken breats for this? Or must they be defrosted first? I recommend defrosting them first. Can I use the chicken with the bone? 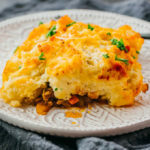 I would love to try this recipe but wondered if one can double this recipe using twice the ingredients? Yes, you can double the ingredients. Keep the pressure cooking time the same. This was so delicious! I changed it slightly to use what I had – added 2 garlic cloves and an onion, used shiitake mushrooms and shredded Italian cheese mix with Parmesan, provolone, Asiago.. I had it with tater tots and doused them in the gravy. Will definitely make this again!! Yum! Glad to hear you were able to tweak this to your liking, Carmen. Do u think I could use FF half & half instead of heavy cream? That would probably work. The gravy would be less thick but should still taste great. So good! I made as instructed, but added dried basil. I also doubled the recipe. I served it with buttered egg noodles and peas. Thanks for a great keeper! Basil is a nice touch. Glad you enjoyed this!